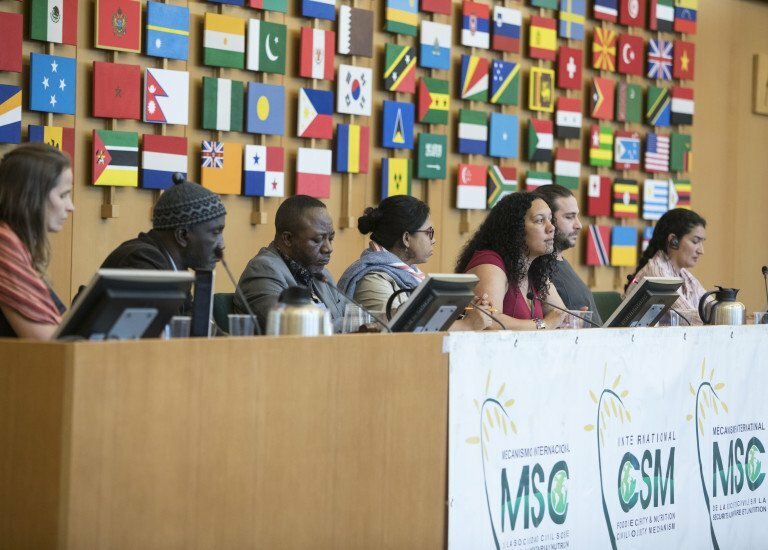 More than three hundred participants, from all continents gathered for two days to agree civil society’s positions ahead of the week‐long 45th Plenary Session of the UN World Committee on Food Security (CFS), 15‐19 October. Chairing the opening session of the forum, Saul Vicente Vasquez, from the Indigenous Peoples constituency, said the right to food, dignity and life cannot be dissociated from each other. “There is no dignity without adequate food and the right to adequate food is an essential human right that needs to be defended, respected and exercised worldwide,” he said. Speakers at the opening session includeed the UN Food and Agriculture Organisation’s General Director, the president of the CFS and the International Fund for Agricultural Development (IFAD) representative. All acknowledged the tragic situation of rising world hunger and malnutrition. For civil society it is, therefore, essential to return a human rights approach to the heart of decision-making and governance on food security. “It is a human right that is violated and many people are deprived of food, as the UN report confirms”, said Ramona Dominicioiu, from the Civil Society Mechanism. Ramona was referring to the recently released UN report on the State of Food Security and Nutrition in the World, which finds that at least 821 million people – more than all of the current population of Europe together ‐ do not have enough to eat. The report confirms what those on the frontline of food insecurity know – the world is not on the right track when it comes to fighting global hunger and the ‘zero hunger’ by 2030 Sustainable Development Goal is at risk of not being met. The participants of the civil society forum, some of them from countries that are most affected by hunger and malnutrition, believe that their perspectives must be taken more seriously by the governments and institutions that take political and practical decisions on food governance. They represent constituencies including smallholder farmers, pastoralists, fisherfolks, indigenous peoples, agricultural and food workers, landless, women, youth, consumers, urban food insecure and NGOs. The Civil Society and Indigenous Peoples Mechanism (CSM) is the convener of the forum and articulates the voices and positions of these constituencies at the CFS Plenary meetings. Organizations and movements that participate in the CSM space, including those of small‐scale food producers and consumers, are believed to have more than 300 million affiliated members in all continents. In the video below, Elene Shatberashvili from Biological Farmer Association Elkana and La Via Campesina, Georgia, explains what civil society forum is all about and why it is an important space. Organisations and movements participating in the CSM include the rights‐holders, subjects of their own development and are the most knowledgeable contributors to debates on food security and nutrition worldwide, despite being among the most affected by food insecurity and malnutrition. “Not only do we know the reality but also we are part of it. We are living the day to day reality in our country as food producers, fishers, consumers, agricultural and food workers. Who, more than us, should be listened to in the debates about food policies?” asks Azra Sayeed, from the International Women’s Alliance, Pakistan. The CFS, as the most inclusive international and intergovernmental platform, is also a space of lively debate where food ideologies are contested and developed. It is not hard to imagine how challenging it is to find agreement, in a space where multi‐actors have different interests. While it is common ground that the hunger crisis is a reality, opinions differ as to the solutions. Most CSM participating organizations defend agroecology, an alternative form of sustainable agriculture, and food sovereignty as the alternative paradigm to transform current food systems.